Formal Institutions and the Production of Informal Urban Spaces | LessIsLess! The paper provides an introductory theoretical framework for this special issue. Firstly, the main weaknesses of the traditional ‘geography of informality’ are analyzed, including its tendency to focus on urban poverty in the ‘Global South’, to privilege its economic causes, and to treat the phenomenon in terms of clear-cut dichotomies. Then we stress the need for new critical approaches, which consider informality as an ordinary mode of the production of space that is structurally entangled with formality. In particular, the links between formality/informality and power, politics and policy require further investigation. 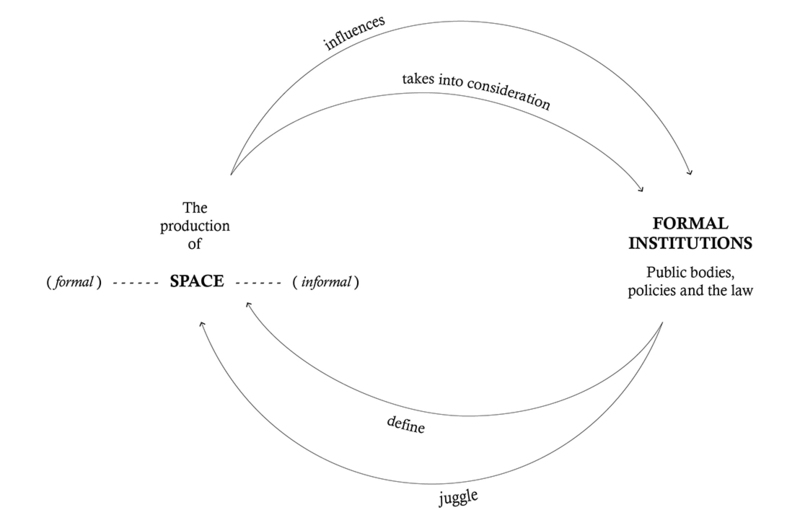 To this end, this paper suggests a ‘four-lane two-direction road’ model which summarizes the main reciprocal impacts and influences between formal institutions and the production of formal/informal spaces. The special issue of Geography Research Forum (vol. 36, 2016), edited by Erez Tzfadia and Francesco Chiodelli, titled “Formal Institutions and the Production of Informal Urban Spaces”, and can be accessed online for free here.